It goes without saying that this should perk the ears of other anti-vaccine so-called physicians (or physicians in title only, as no physician worth their salt would ever be anti-vaccine). They should be very, very careful about how they carry on their business of promoting anti-vaccine science. “Now, if I were to do a study (and have several million bucks to fund it), here’s how I would look at the question of whether or not an increased number of vaccines relates to an increased risk of autism: I would take a bunch of kids who had all the vaccines on the regular schedule and look at the rate of autism in that group. We know that it’s about 1 in 50 kids. Then I’d take a whole bunch of kids who were only partially vaccinated and look at the rate of autism. I would subdivide the partially vaccinated group into subgroups based on the total number of vaccines given during infancy. I would perhaps have a group that delayed vaccines. And hey, while we’re at it, let’s really go crazy and find a few totally unvaccinated kids just for fun. On the other hand, no. Let’s not. 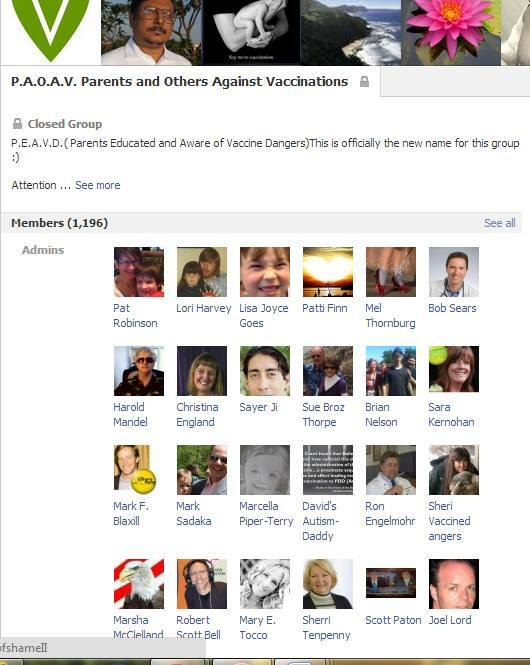 It would be totally unethical to subject a group of totally unvaccinated children to any type of medical research. Ok, back to my study. These data would then give us a true look at autism rates compared to number of vaccines given and the age at which they were given. Really? IF you had the money? You haven’t made enough from your books, Dr. Bob Sears? And when the heck did you become an epidemiologist? Oh, you didn’t. I can tell from your study “design.” The study you’re criticizing (PDF) is a case-control study. The researchers started with cases (kids with autism) and controls (kids who were neurotypical). They then assessed if there was a difference in the number of antigens and vaccines they received. That is, was there a difference in the odds of getting a vaccine as it relates to autism? There wasn’t. Kids with autism were just as likely to be exposed to vaccines as kids without autism. We do case-control studies when the cases are too few in number. We do it to get a good idea of causality. We do it because it’s the right study to do, Dr. Bob Sears. 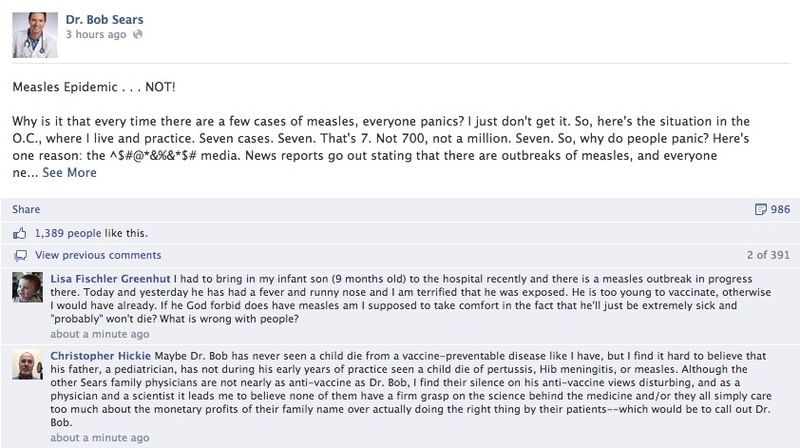 That’s not what the anti-vaccine people, like Dr. Bob Sears seems to be, want to hear. Dr. Bob Sears wants a retrospective cohort study, where you take kids with different levels of exposure and then go back through medical records to see if they are autistic, or how autistic they are. It sounds reasonable, right? The problem with that study design is that autism is rare, even at a 1 in 50 prevalence rate. To get a significant number of autistic and non-autistic kids for comparison, you’d have to enroll thousands and thousands and thousands of kids. If you don’t do that, you run the risk of having too small a sample, screwing up the statistics. Further, it’s really hard to assess temporal (chicken or egg) associations. And there are all sorts of biases, including selection and recall bias that can affect your results. And we couldn’t possibly do a prospective cohort study because, well, it would never go through an IRB. Never. Never ever. But it’s not like Dr. Bob Sears has a mastery of vaccine science. He doesn’t. So why assume he knows anything about epidemiology? Dr. Bob Sears has revealed his true anti-vaccine nature. Can’t wait for the next measles outbreak from one his patients and for him to deny it. Now, for a list of studies that have found no association between vaccines and autism, check out the Autism Science Foundation’s page on the subject. But Dr. Bob Sears is right on one thing, how much more should we waste?